New third-gen Google Chromecast goes on sale before official launch | What Hi-Fi? In August an FCC filing by Google suggested that a next-gen Chromecast streamer with improved wi-fi connectivity and full Bluetooth support would soon be on its way. Well, now that third-gen device has arrived… albeit prematurely. The new dongle was undoubtedly going to be unveiled at its annual hardware launch next week (October 9th), but one Best Buy store in the US has ruined the surprise by mistakenly putting it on sale early. A customer who managed to pick one up over the weekend has posted the details on Reddit. GroveStreetHomie shared a photo of the device, which he has described as “a little thicker [in comparison to the 2nd-gen version]. The top is no longer glossy and the Chrome logo has been replaced with the G Google logo”. 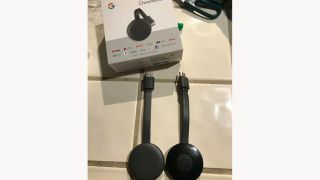 The Reddit user also noted that it still had micro-USB connection, that the magnetic clasp on the tip and base of the Chromecast had been scrapped, and that it was also the same price as the 2nd-gen Chromecast. It should retail for £30 in the UK, then. GroveStreetHomie said he could not use the device yet, however - it requires an update via the Google Home app that hasn’t been released yet. He shouldn’t have to wait too long to get up and running though, with the launch event (and on-sale date) just a week away. We expect full details of not only the streamer but also several new Google products to be revealed then.